EUSTOCHIUS, the successor of St. Brice (13th November) as Bishop of Tours. He served seventeen years as Bishop, during which time he attended the Council of Angers (453), and reposed in 461. St. Gregory of Tours (17th November) called him "a prelate of resplendent holiness." FELIX and CONSTANTIA, according to tradition SS. Felix and Constantia were first century martyrs during Nero's reign in Nocera, a town between Naples and Salerno, where their relics are venerated. No further information is extant. GOERIC (ABBO, GOERICUS, GURY), the successor of St. Arnulf (18th July) as Bishop of Metz. As bishop he transferred the relics of St. Arnulf to the Church of the Apostles, and also built the church of Great St. Peter's and the monastery at Epinal, he was also a personal friend of Dagobert I. St. Goeric reposed 647. You became pastors for your godly wise people. Beacons for all the world. As you intercede for our souls. O Januarius, our glorious father. And from the fire of Vesuvius. With faith and love we venerate you and honour your holy relics! JANUARIUS (GENNARO), Hieromartyr Januarius the first Bishop of Benevento, along with SS. 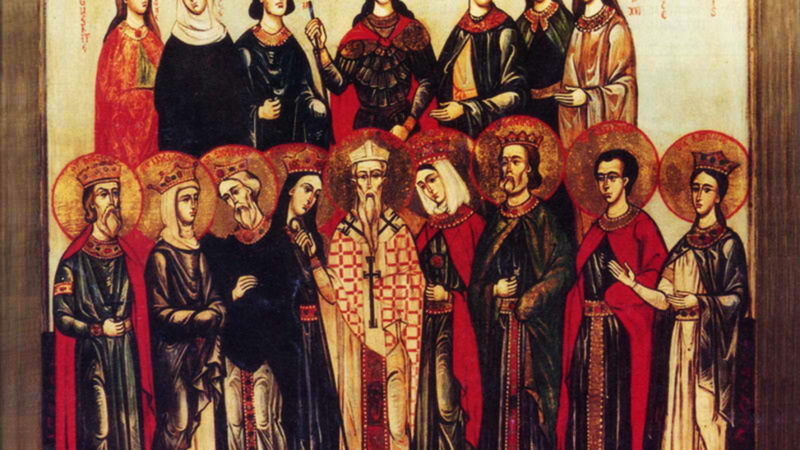 Festus, his deacon; Desiderius, a reader; Sosius, deacon of the Church of Misenum; Proculus, deacon of Puzzuoli; and two others were beheaded at Pozzuoli during the Diocletianic Persecution (circa 305). His relics were enshrined in Naples of which he became the patron-saint. The annual liquefaction of St. Januarius’ blood, a well-known miracle is credited with the conversion of countless sinners. Preserve us all, entreating God who loves mankind! As a precious treasure and fountain of healings. And you avert the evils of Vesuvius’ fire. POMPOSA, a nun near Cordoba who in 853 was beheaded by the Moors for refusing to renounce Christianity. SEQUANUS (SEINE, SIGO), a native of Mesmont, in Burgundy, St. Sequanus received monastic tonsure at Moutier-Saint-Jean de Réôme near Dijon. In 534 he founded the Abbey of St. Mary in the heart of the Cestres forest, near the Seine, where the present-day town of Saint-Seine-l'Abbaye is located. St. Sequanus reposed circa 580, and he was buried at his Abbey. 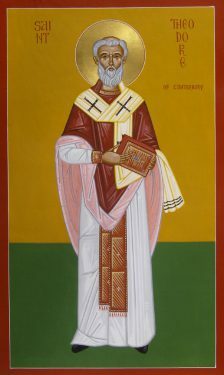 THEODORE OF CANTERBURY, one of the greatest figures in English history and one of England’s great saints, St. Theodore was a Greek from the Holy Apostle Paul’s (29th June) hometown of Tarsus who lived a Greek monastery in Rome. A highly-educated monk, he rapidly advanced through the clerical ranks culminating in his consecration as the eighth Archbishop of Canterbury in 668 at the age of sixty-five. Initially Pope Vitalian had offered the See of Canterbury to the future St. Adrian (9th January), who declined and recommended St. Theodore. While the Pope concurred, he feared St. Theodore’s orthodoxy had been compromised by his Greek traditions and so sent him to England in the company of SS. Adrian and Benedict Biscop (12th January). Upon his arrival in England, St. Theodore embarked upon a visitation of the whole of England. He established a school at Canterbury where Greek was taught, and commenced reforming the government of the English church, filling vacant Sees, even dividing the See of York. This brought him into conflict with St. Wilfrid (12th October), resulting in St. Theodore deposing St. Wilfrid (whom he had consecrated). This was followed by the Synod of Hertford, which St. Theodore called in 672 or 673; not only was this the first important synod in England, but the first at which representatives of the entire English church were present. At Hertford, ten canons were promulgated concerning itinerant monks, the authority of bishops, the regular convening of subsequent synods, marriage, divorce, and prohibitions of consanguinity, and settling finally the adoption of the Roman practice for the calculation of the date of Easter. This was followed in 679 by the Synod of Hatfield at which a declaration of orthodoxy was drawn up and forwarded to Rome at the request of Pope Agatho, and the heresy of Monothelitism was condemned. Through all of these acts, St. Theodore not only unified the English church, but also definitively established the metro-political authority of the See of Canterbury. He is therefore often called the ‘second founder of Canterbury’. St. Theodore’s writings, some of which have only recently been definitely ascribed to him, comprise the Iudicia , which preserves his opinions on matters of ecclesiastical discipline and penance, the Laterculus Malalianus , a brief treatise which is partly chronological and partly exegetical, a Latin translation of the Greek Passio S. Anastasii , as well as a corpus of Biblical commentaries. There is also a ‘Penitential’ attributed to him. St. Theodore reposed in 690, and his body remained incorrupt for a long time. proclaiming the peerless Gospel of Christ among the Angles and Saxons. Truly wondrous art Thou, O Saviour, in Thy holy bishop and in all the saints!